The Canadian Centennial Choir will perform a newly commissioned work, Nisi Pontus et Aer, on May 3. This piece is composed for choir, string quartet, percussion and piano. It is a setting of a passage from Ovid’s Tristia in which the poet describes vividly a storm he encounters on his way into exile. Whether intended by the ancient writer or not, I hear a bit of political allegory in his words that seems timely even today! The Capital Chamber Choir will perform In Manus Tuas in concert on Saturday March 22. This concert will feature the extraordinary Concerto for Choir by Russian composer Alfred Schnittke, performed by the CCC with the Ewashko Singers and Calixa Lavalée, under the direction of Lawrence Ewashko. An event not to be missed! 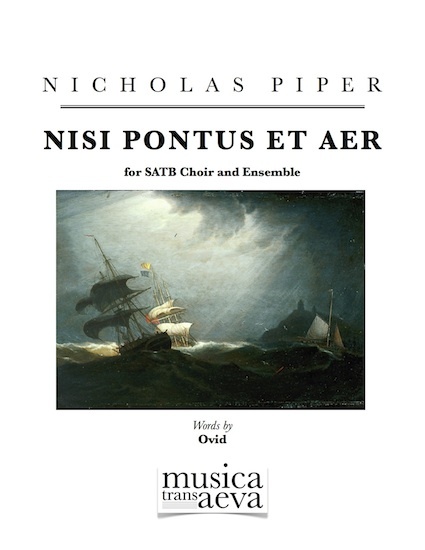 Nicholas Piper is a Canadian composer specializing in rewarding music for choirs. He is also the main proprietor of Musica Trans Aeva.